Jonathan Borchetta, a professional photographer who photographs Las Vegas from the restaurant and nightclub, said the citywide views gave him the idea of a thrill ride. The concept was solidified, he said, when he saw people rappelling off the hotel-casino tower for charity. He and partner Joe Shortal formed New Capital Ventures with Stan Checketts, the creator of more than 200 amusement rides, including the Big Shot at Stratosphere. Cost to build the attraction is “under $1 million,” Shortal said. The business is leasing the space for the ride atop the Rio and is expected to employ 35 to 40 full-time workers to operate the system. Caesars Entertainment Corp., which owns the Rio, is sharing in the ride’s proceeds. Rio Director of Hotel Operations Kevin Donnelly said he was sold on the idea because it was another way for guests to take in the views of Las Vegas offered by the VooDoo Lounge. The ride will be open from noon to midnight daily. Cost per ride is expected to be $25 per person in the daytime and $40 in the evenings. Shortal said he hopes the ride will be open by late July or early August. “There will be some great views for photos,” Borchetta said. The developers received approvals from the Federal Aviation Administration and Clark County to operate VooDoo Skyline. Zip lines are popping up in Southern Nevada. A Fremont Street zip line will be replaced by Slotzilla, a 100-foot-tall slot machine-themed structure with two landing pads. One pad is being built near the Fremont, 850 feet from the tower. The line will send riders 75 feet in the air under the world’s largest LED video screen. The second landing pad will be in front of the Golden Gate. The zip lines will hurl riders at speeds of 35 mph as they lie flat on a harness in a “superhero position” 112 feet above the ground. Flightlinez Bootleg Canyon in Boulder City offers several zip line experiences. 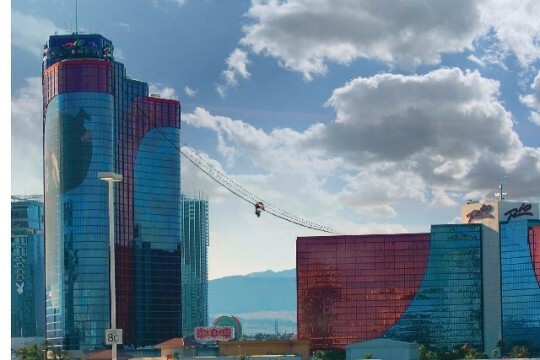 Last year, MGM Resorts International announced tentative plans for a zip line connecting Luxor and Excalibur over a series of zigzag lines.